67 Jackknife Couch removed from a 2018 Freedom Elite. Couch like new. Only noticeable flaw is a hole in the foot panel where a heat vent was installed. Will entertain any offer, but buyer must be able to either pick the couch up in central Arkansas or be willing to pay for shipping. 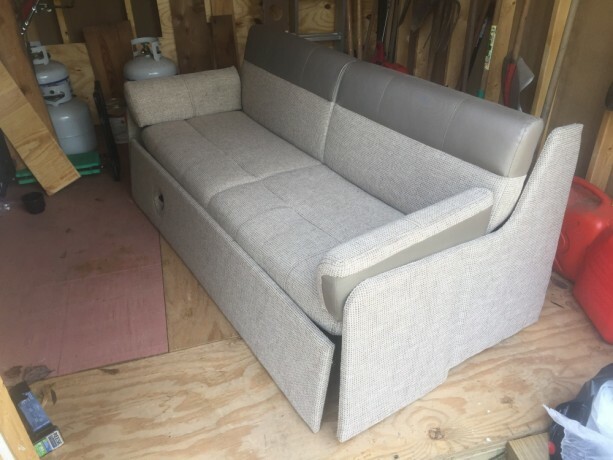 What�s the dimensions on this sofa, looking for a gray sofa for my Thor ace 29.2. If it�s where mine is. Then we can work something out. The sofa is 68� long with the end panels installed. From the base of the sofa to the top of the seat back it�s 30�. From the base to the seat cushion it�s 14-1/2�. The seat cushion is 20� deep and the seat back 17� from the cushion to the top of the back. I guess that would make the folded Down depth of the sofa 37�.